For reservations withnon-refundable rate, standard cancellation policy does not apply. in advance) and refundable security deposit (paid apon arrival) may be required. the facts stated above by a written document at the latest 3 days after they emerge. Please note that we do not accept reservations for Stag/Hen/Bachelor Parties. No matter if you are captivated by our perfect location, personal approach or unique combination of traditional and modern features, there is one thing we know for sure – you will never ever want to stay anywhere else. We offer accomodation in private rooms (single, double, twin, quadruple). All our rooms have shared bathrooms and toilets, but do not worry – we keep everything as clean as possible and even when we are fully booked, you will never wait in queues. In addition to our private rooms, we also have beautiful spacious apartments with private kitchen and bathroom (some of them even have a roof terrace!). If you wish to find out more, do not hesitate to contact us directly. Furthermore, all guests have access to common dining room and fully equipped kitchen (fridge, microwave oven and stove). High-speed wi-fi connection is of course available in the entire building. If you are a coffee enthusiast, then you should not miss our coffee machine with its delicious espresso, cappuccino or latte macchiato. There is also a wide selection of tea at your disposal. For a modest fee you can buy a beer, lemonade or a bottle of quality wine. Moreover – it all comes from selected local producers. Our employees are always willing to help you find an ideal evening program – no matter whether you are interested in culture, sport, or just looking for a nice pub. Free city maps are provided at the reception desk as well. If you wish to do your laundry, you can use our washing and drying machines (for a modest fee), or borrow an iron. In addition to our private rooms, we also have beautiful spacious apartments with private kitchen and bathroom (some of them even have a roof terrace!). If you wish to find out more, do not hesitate to contact us directly. Our reception desk is opened every day from 8AM till 12PM. We accept CZK, EUR and credit card payments upon the arrival. This place is fantastic. It has a nice kitchen and dining area and the staff are friendly and helpful. 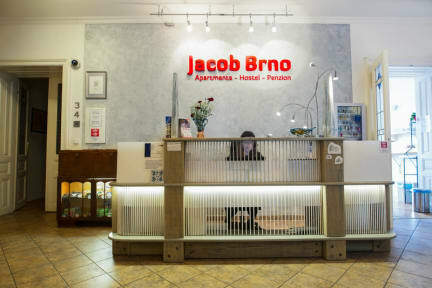 I would stay here if you are in Brno. We stayed in this hostel for one night and we enjoyed the stay. The room was nice and the bed was comfortable. Also everything was very clean and the staff was friendly. Really great rooms that were cozy and clean. It has more of an apartment/hotel vibe than a hostel vibe so it’s not the best place to meet people but it’s a super peaceful spot. I’d stay here again. 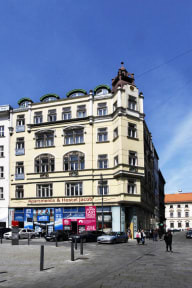 Good place and quite cheap given I had my own room and was right in the centre of Brno, I mean in the very centre! It is not a place to meet people at all, in fact I only laid eyes on another person once in the few days I was there, however it was perfect for what I was looking for which was a couple of days of relaxing and quiet time. Brno is a great place to visit with some quality bars and great coffee shops, do a bit of googling and seek them out. Great place in a perfect location for exploring Brno. Staff were fantastic and helpful. Facilities were clean. My room was a little on the warm side but it was manageable and a fan was provided. There wasn't much of a common area so if you're looking for a party atmosphere it might not suit you, otherwise I'd highly recommend it. Walkable location! 8m walk from train station after dark felt safe. Hostel sits right on Jakubské Square where locals hang out nightly to drink (interesting atmosphere) but room wasn't noisy. Property still felt safe, locked front door, working elevator. Staff was helpful, available to check in after 11pm, out at 7:30am, offered hot beverages and let us sit in the lobby to charge cell phones until we caught a night train. Luggage storage, hot shower. Laundry for a fee. I'd recommend this. Súper Nice room, comfy beds and lovely decor including parquet floors. Shower and wash facilities were good and the little kitchen and large living space an extra bonus. Barely heard the other guests.